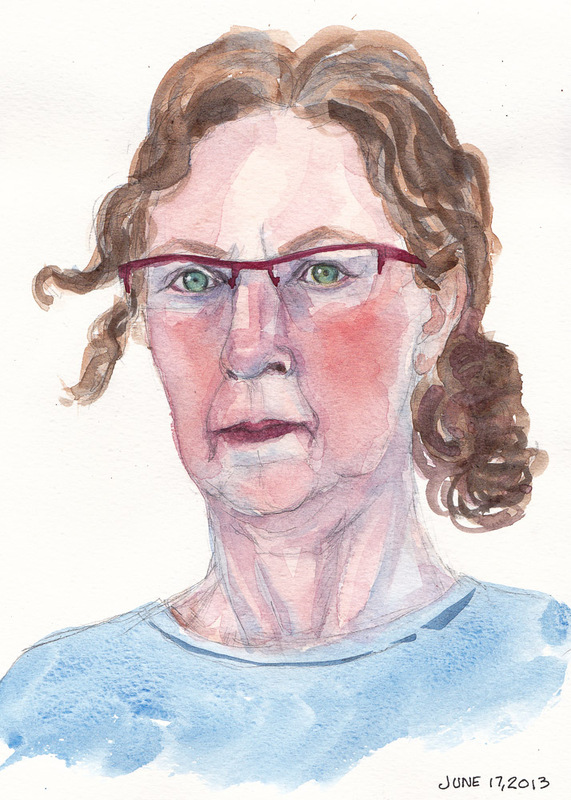 I wasn’t satisfied with the two ink and watercolor end-of-journal self-portraits (below) that completed the 8×10″ Moleskine I was working in back in June. 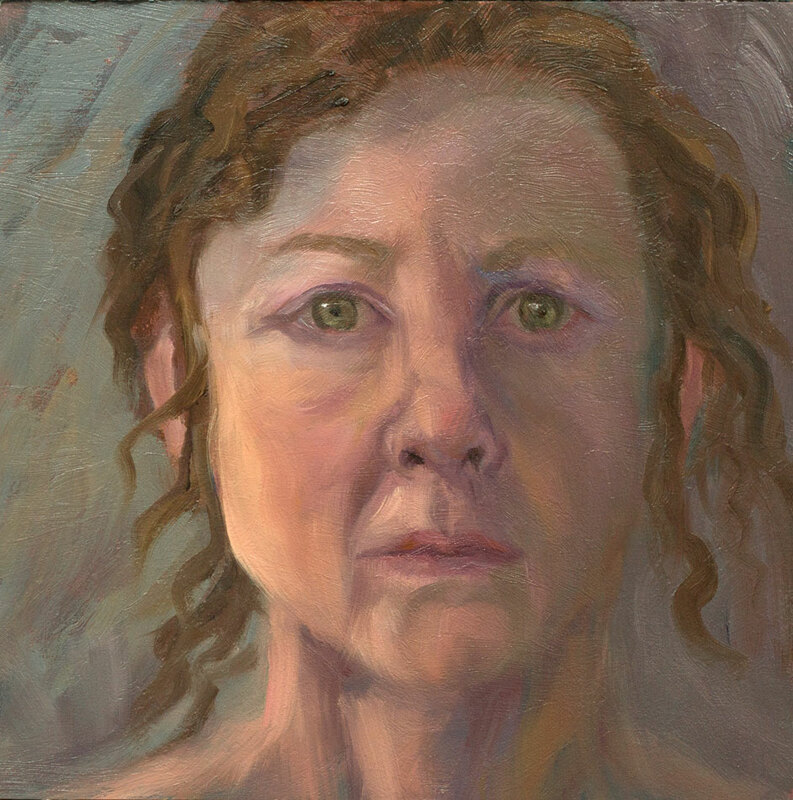 Rose Frantzen had told me during my workshop with her that I had wonderful skin to paint and should be doing lots of self-portraits from life in oil. So I decided to give it a try. I only had couple of hours left in the day for painting so chose a small 6×6″ panel that already had a dark background from wiping off a previous failed painting. I turned off most of the lights in the studio except for one pointing at my face from the left and one overhead light behind me. I clamped a mirror to the easel and started painting. What a surprise: after a couple of hours I’d made my most favorite self-portrait ever. I know it’s not perfect but I don’t think it calls for perfecting; it’s just a moment in time and a record of a very enjoyable but short painting session. I was in a much better mood. 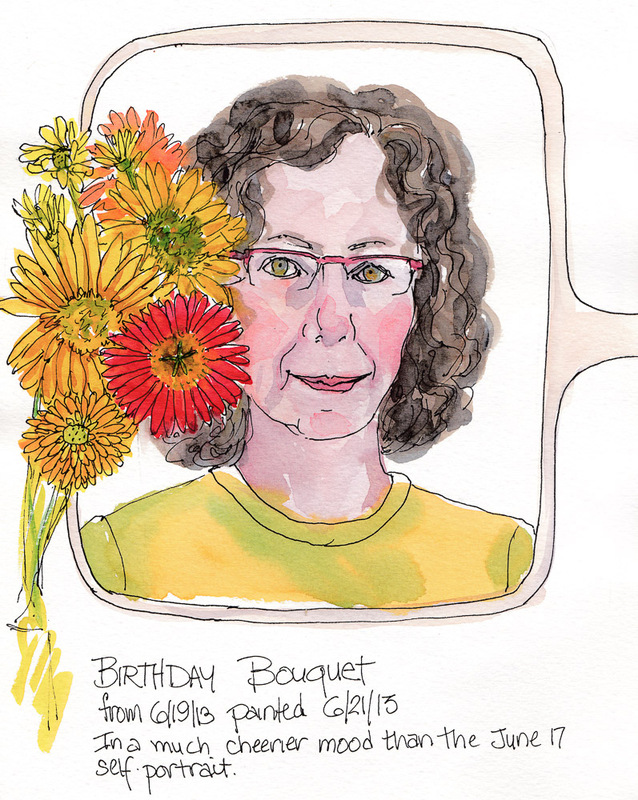 I put my birthday bouquet on the table between me and the mirror and started drawing. It was confusing trying to combine what was real and what was mirror image. It’s a dorky drawing of me but I like the flowers. Isn’t it amazing how emotions and mood show in a drawing or painting? It’s like there are two different people in these two sketches: mean, tense, bossy-lady and sweet, flowery, dorky girl. The oil portrait is lovely and very soulful. You have captured such a compelling emotion. The color and light are perfect. It’s more of a portrait of a universal theme, there’s worry and acceptance in the expression. I love your sketchbook ones, too. The grumpy one is wonderful, it reminds me of a teacher I once had, or myself when I’m grumpy. All of these express a lot and show your versatility. Beauty has many different faces. Love the sketch one with flowers. Jana this portrait is wonderful, I really love this one. I’ve never wanted to do a self portrait but you make me want to. You’ve done a beautiful job. I’m so glad you took Rose’s suggestion and painted your portrait in oil. I can’t believe its only 6″ x 6″. Beautiful, beautiful … beautiful. When and if you decide to paint another will you share some step-by-step shots? I love this Jana…. you did a great job. Wonderful portrait Jana! I like the sketches, but your portrait is at once universal and specifically you. Beautiful job on the oil portrait, it’s just wonderful! We’ll be seeing more of these, yes?